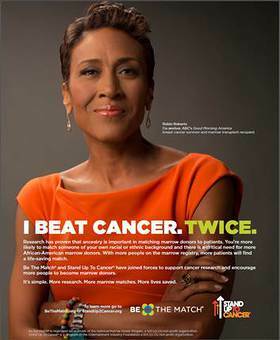 Be The Match and Stand Up To Cancer (SU2C), a program of the Entertainment Industry Foundation (EIF), have teamed up on a new public service announcement (PSA) campaign featuring ABC’s “Good Morning America” anchor Robin Roberts. The PSAs, titled “I Beat Cancer. Twice” and “Focus on the Fight. Not The Fright,” emphasize two critical ways to help patients battling blood cancers like leukemia and lymphoma: supporting cutting-edge research and increasing the number of volunteer bone marrow donors on the national Be The Match Registry. Roberts also specifically addresses the critical need for more African-American volunteer bone marrow donors. “Good Morning America” unveiled the joint PSAs during its broadcast on Martin Luther King Day. The campaign, which runs through June 30, will appear in magazines and out-of-home, digital, mobile and social media. Roberts began her crusade to recruit bone marrow donors shortly after announcing in June 2012 that she was battling myelodysplastic syndrome (MDS) and needed a bone marrow transplant to survive. Though she was fortunate to find a perfect donor match in her sister Sally-Ann, Roberts has worked tirelessly to raise awareness about the need for more people – particularly African Americans – to volunteer as potential bone marrow donors in order to improve all patients’ chances of finding a life-saving match. Roberts, an Ambassador of Hope for Be The Match, celebrated her one-year transplant anniversary in September. 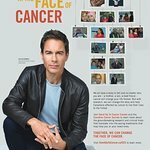 “I’m proud to work with Be The Match and Stand Up To Cancer to raise the public consciousness about the need for more research and more volunteer bone marrow donors to help patients contending with blood cancers,” Roberts said. Jeffrey W. Chell, M.D., chief executive officer of Be The Match, complimented Roberts on her “tireless advocacy” for others battling blood cancers.